We have received a written response from the Student Health Support Division of the Busan Bukbu Office of Education regarding our petition, “Busan Buk-gu District – Shut down the Gupo Dog Meat Market in the “School Cleanup Zone”!” This campaign was originally launched in 2014 and was re-launched on March 6, 2018. Click HERE for our campaign page. 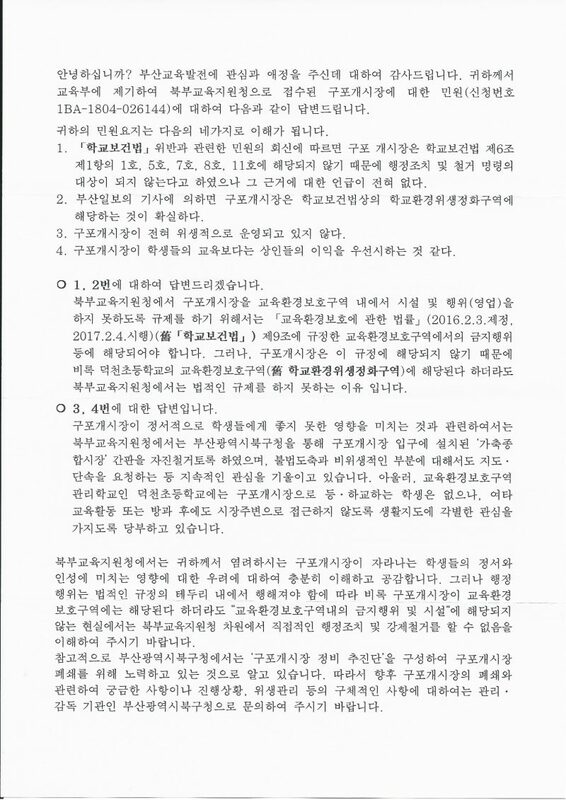 The letter is in the Korean language with no English translation, despite the fact that our protest letter was in both English and Korean, and the majority of our supporters who had written are not Koreans. The letter does not include the name of the sender at the Busan Bukbu Office of Education nor the contact info for further inquiries. Hello, We would like to thank you for your interest in the advancement of education in Busan. Your letter to the Ministry of Education regarding the Gupo Dog Meat Market (civil complaint ID number: 1BA-1804-026144) was assigned to the Busan Bukbu Office of Education for a response. 1. It was the opinion of the Busan Buk-gu District Office that Article 6, Paragraph 1, Subparagraphs 1, 5, 7, 8 and 11 of the School Health Act do not apply to the Gupo Dog Meat Market and that the Gupo Dog Meat Market is not subject to administrative action or removal. This opinion was issued by the Busan Buk-gu District Office without comment as to why the above provisions of the School Health Act are not applicable. 2. The Gupo Dog Meat Market is within the boundary of the “School Environment, Hygiene, Cleanup Zone” specified in the School Health Act as evidenced by this Busan News article. 3. Unsanitary conditions at the Gupo Dog Meat Market. 4. Busan Buk-gu District put the interest of dog butchers and shops before the education of their young children. Below is the response to your points #1 and #2. 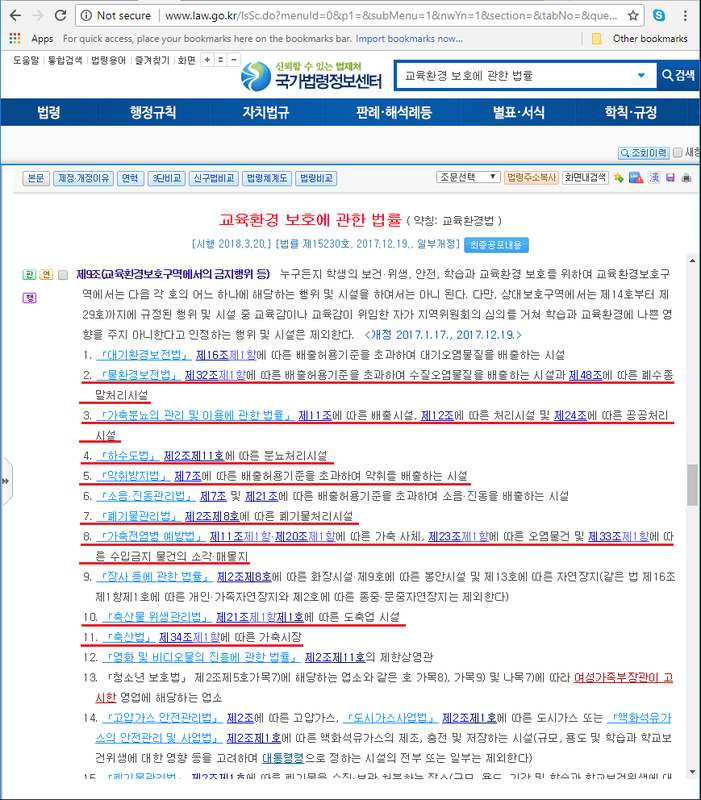 For the Busan Bukbu Office of Education to take administrative action to ban Gupo Dog Meat Market from operating within the School Environment, Hygiene, Cleanup Zone, they must violate the list of prohibited acts stipulated in Article 9 of the “ “Educational Environment Protection Act”” (enacted February 3, 2016, enforcement on February 4, 2017). However, this provision does not apply to Gupo Dog Meat Market and therefore, even if they are within the boundary of Deokchun Elementary School’s School Environment, Hygiene, Cleanup Zone, the Busan Bukbu Office of Education cannot take any legal actions. Below is the response to your points #3 and #4. Regarding the Gupo Dog Meat Market’s negative effect on the mental health of children, Busan Bukbu Office of Education has asked Busan Buk-gu District office to take actions such as urging voluntary removal of “Livestock General Market” signage located at the entrance of the Gupo Dog Meat Market, as well as continuous inspection and guidance regarding the illegal slaughter and unsanitary environment. There are currently no children from the Deokcheon Elementary School who walk through the Gupo Dog Meat Market on their way to and from school. However, we have asked the school to provide guidance to children to never to go near the Dog Meat Market while participating in the extra educational activities, or after school hours. We, Busan Bukbu Office of Education, fully understand your concern regarding the effect the Gupo Dog Meat Market can have on the children’s emotional health and character. However, administrative action must only be taken within the boundaries of the laws. Therefore, we ask for your understanding that Busan Bukbu Office of Education cannot take administrative actions or involuntarily demolish Gupo Dog Meat Market even though it is within the School Environment, Hygiene, Cleanup Zone because “Prohibited Acts, etc. in Educational Environment Protection Zones” does not apply. For your information, it is our understanding that the Busan Buk-gu District Office formed a task force to address Gupo Dog Meat Market issues and they are working towards closing down the dog meat market. Therefore, in the future, please forward your questions and concerns regarding the Gupo Dog Meat Market to the Busan Buk-gu District Office. So, let’s take a look at Article 9 of the Educational Environment Protection Act (Prohibited Acts, etc. in Educational Environment Protection Zones). Click HERE to see the English translation from Korea’s National Law Information Center. Or see below the screenshot of this page. Take a look at the list of 29 different types of facilities that are prohibited under this article. It seems that Gupo Dog Meat Market falls under at least several of these prohibited facilities. 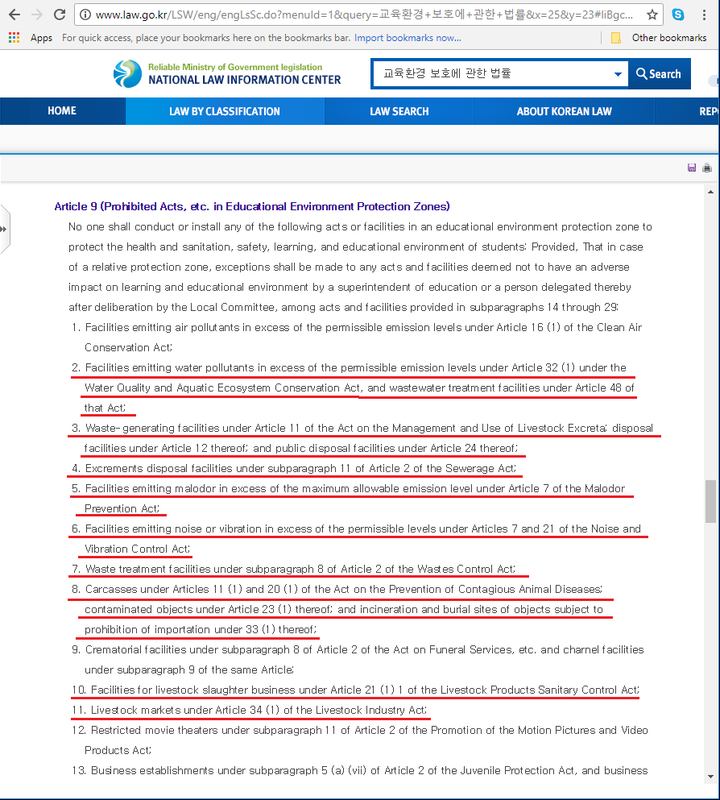 Can this be negligence on the part of Busan Bukbu Office of Education to not understand what Article 9 is about, or is this an intentional deceit to excuse their neglect and inaction? Perhaps they are not aware that that we are bilingual, and information about Korean laws are available online from anywhere around the world? We definitely need clarification and more details which is more thorough, credible and honest from the Busan Bukbu Office of Education. In addition, we are told from a local source that the Busan Buk-gu District Task Force on the Gupo Dog Meat Market issue isn’t doing anything. Please send a response letter to the Busan Bukbu Office of Education. Send copies of this letter to the Ministry of Education and Busan Bukgu District Office. It seems that the Gupo Dog Meat Market falls under several of these prohibited facilities. In addition, we are informed that the Busan Buk-gu District Office’s Task Force for the Gupo Dog Meat Market is ignoring their responsibility to the public and is not actively working to resolve this issue. In our opinion, this is unacceptable. We request a thorough and honest clarification from your office. 부산광역시 북부 교육지원청에서 보내온 답변은 아래와 같습니다. 그러나 북부 교육지원청에서의 답변은 옳지않다는 것을 저희는 잘 알 수 있습니다. [교육 환경보호에 관한 법률] (2016.2.3 제정, 2017.2.4 시행) 제9조를 보면 다음과 같은 규정이 있습니다. 누구든지 학생의 보건•위생, 안전, 학습과 교육환경 보호를 위하여 교육환경보호구역에서는 다음 각 호의 어느 하나에 해당하는 행위 및 시설을 하여서는 아니 된다. 다만, 상대보호구역에서는 제14호부터 제29호까지에 규정된 행위 및 시설 중 교육감이나 교육감이 위임한 자가 지역위원회의 심의를 거쳐 학습과 교육환경에 나쁜 영향을 주지 아니한다고 인정하는 행위 및 시설은 제외한다. 구포개시장이 교육 환경보호에 관한 법률 제9조에 명시된 교육환경보호구역에서의 여러 금지행위에 해당되는 행위 및 시설을 하고 있다는 것을 분명히 확인할 수 있습니다. 그리고 언급하신 구포시장 정비추진단은 현재 별 활동이 없다고 들었습니다. 이런 부분들에 대해서 명확하고 솔직한 답변을 해주시기를 요청드립니다. how can they tolerate this ? are they blind ? the korean image around the world is horrible !!! little by little the people of the whole world will reject this disgusting behavior !!! why they are so cruel ? ” the man who is cruel with the animals, can not be a good man ” !!!! Mahatma Gandhi !!! WE NEED TO BE STRONG AND RESOLUTE AGAINST THIS BARBARIC INDUSTRY, A HEINOUS PRACTICE THAT HAS CAUGHT THE ATTENTION OF MILLIONS OF PEOPLE AROUND THE WORLD. IF SOUTH KOREA AND MANY ASIAN COUNTRIES WANT TO BE RESPECTED, THEY NEED TO STRENGTHEN THEIR ANIMAL PROTECTION LAWS. Vorrei una bomba atomica su chi è cosi vigliacco. I can’t find any email-address of the 3 persons mentioned above. Wow! Fine! Butchers can be anywhere, and the children must avoid them! In a normal mind things are exactly the opposite: chuldren can be wherever they want, and it’s the adults’ duty to keep bad things away from them. Is this a war zone that children are told to stay away from here and from there& And WHAT horrors the children imagine when they are told such things? This damages their health as well. It’s clear to me now that they don’t care about the children – in the same way as they don’t care about the dogs. Not surprising – those who are ignorant to animals are also ignorant to anyone.